Corner of Ridley Road market. Didn't care for the Dutch halal chicken but greatly enjoyed the theatre. OPEN Dalston thinks there won't be one. Neither do Iain Sinclair and Michael Rosen, who will be talking and reading at Cafe Oto tonight from 7.30. And there's more. I spent a little time - a very little time, I'm afraid - at the This Is Not A Gateway festival on Saturday, accompanied by my six year-old. We went into Cafe Oto where she had a hot chocolate and I had a coffee while eavesdropping on a discussion among the group of people pictured here. I took one other photo but it was even dingier than this one. Moreover, its foreground was not enlivened by one of my new brogues, which means it stands no chance of being considered art. "We formally established This Is Not A Gateway in late 2007 with the aim of addressing the urgent and identified needs confronting current and future cities - namely the need to generate and elevate knowledge about cities 'from the ground up', from emerging practitioners and those often outside 'urban circuits'. It was clear that an inter-disciplinary approach was needed - one that encouraged and supported complexity." I hope that's clear. Yes, I'm being facetious. But, look, I donated a tenner to help them to publish their book, so I'm allowed. What else? Well, there was some discussion of the Iain Sinclair affair and the extent to which it should be seen as an act of censorship by neurotic control freaks in the Town Hall. Was it emblematic of the cultural dimension of the 2012 Games being defined by corporate interests imposing their agenda from above? My six year-old and I left before the end, so I cannot reveal what conclusions were reached, However, I can report that news of the Sinclair cancellation has continued to do good business on the blogosphere, including here and here and here. Nobody is terribly impressed. Hackney Council has opened talks with Ridley Market Road Traders Association (RRMTA) about its plans to redevelop Dalston's market within 2 years...The redevelopment plans have been revealed in the context of a continuing wave of Hackney prosecutions of Ridley Road traders and attempts to revoke their licences. What does the Council say? Now read on. I took this photo back in June while wandering round the site of a scheme characterised by those responsible for it as a "key Olympic transport commitment" (TfL) a "dramatic £160 million boost" (LDA) and an "ambitious scheme [which] will create more than 500 new homes, a library, shops and restaurants." (Hackney Council). By contrast, those against it consider it an expensive exercise in cultural vandalism which, far from bringing new prosperity to the area and its people, will the damage the neighbourhood's character and price many residents out of it. This argument is, of course, familiar to many readers and resembles similar ones all over London and urban Britain generally. If find these all the more interesting because they create such unorthodox political alliances, with localist, conservation-minded Conservatives finding common ground with anti-developer activists on the left in opposing regeneration policies backed by Labour and Tory local authorities alike. 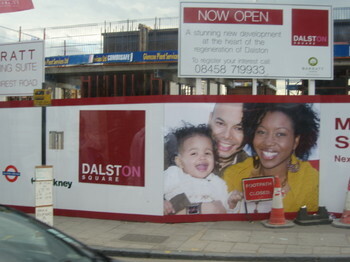 Will the new Dalston "town centre" produce a net gain for local people or a net loss? Now I've got my new London blog rolling and the political conference season is coming to and end, I'm hoping to follow the saga more closely. Your (constructive) input, as ever, is welcome. "The Archbishop of Canterbury is to be urged to support a school caretaker who wants to be rehoused because of 'unbearable' noise and disruption from nearby building works." The school is the Holy Trinity. Now read on. And there's more in the Worthing Herald!